Niemöller at The Hague's Grote of Sint-Jacobskerk in May 1952. 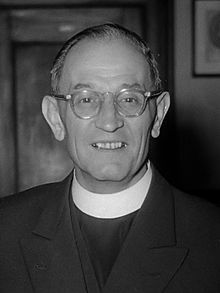 Friedrich Gustav Emil Martin Niemöller (German: [ˈniːmœlɐ]; 14 Januar 1892 – 6 Mairch 1984) wis a German anti-Nazi theologian an Lutheran pastor. He is best kent for his statement, "First thay came for the Socialists, an I didna speak oot acause I wisna a Socialist ...... an thare wis na ane left tae speak for me." ↑ "Niemöller, (Friedrich Gustav Emil) Martin" The New Encyclopædia Britannica (Chicago: University of Chicago, 1993), 8:698.